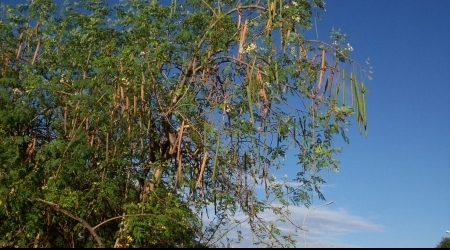 Seeds from Moringa oleifera trees can be used to purify water. Uppsala University leads a research group which has discovered that seed material can give a more efficient purification process than conventional synthetic materials in use today. Clean water is essential for good health. In many countries it is still difficult to obtain clean water. Even developed countries can benefit from a process that treats waste water without addition of further synthetic chemicals. In a project lead by UppsalaUniversity, scientists from several countries have investigated how an extract from seeds of Moringa trees can be used to purify water. A protein in the seeds binds to impurities causing them to aggregate so that the clusters can be separated from the water. A press release about previous work on this topic is available. The study recently published in the journal Colloids and Surfaces A takes a step towards optimisation of the water purification process. Researchers in Uppsala together with colleagues from Lund as well as Namibia, Botswana, France and the USA have studied the microscopic structure of aggregates formed with the protein. The results show that the clusters of material (flocs) that are produced with the protein are much more tightly packed than those formed with conventional flocculating agents This is better for water purification as such flocs are more easily separated. The new study compares protein from the seeds of different varieties of Moringa trees that are grown in different countries. It also allows estimates of the optimum amount of seed extract that should be used to minimise residues in treated water. The work used research facilities at the Institut Laue-Langevin in France and the NIST Center for Neutron Research in the USA. Powerful research tools such as those for neutron scattering are important to tackle challenges facing developing countries as well as industrialised regions. There is a broad interest in new, sustainable methods for water treatment. The research group has already presented results to government agencies and public bodies, particularly in Namibia and Botswana. There are now discussions on best use of Moringa seeds, both to substitute conventional materials in large water treatment plants and in small scale units. “We can envisage that similar materials could be used in Europe both to produce drinking water and to treat wastewater”, says Professor Adrian Rennie. The work has been funded by the ’Research Links’ programme of the Swedish Research Council and Sida.